In order to continue to increase our market competitiveness, Acer strives to develop new listed internal businesses, injecting new drivers of growth and dynamism. 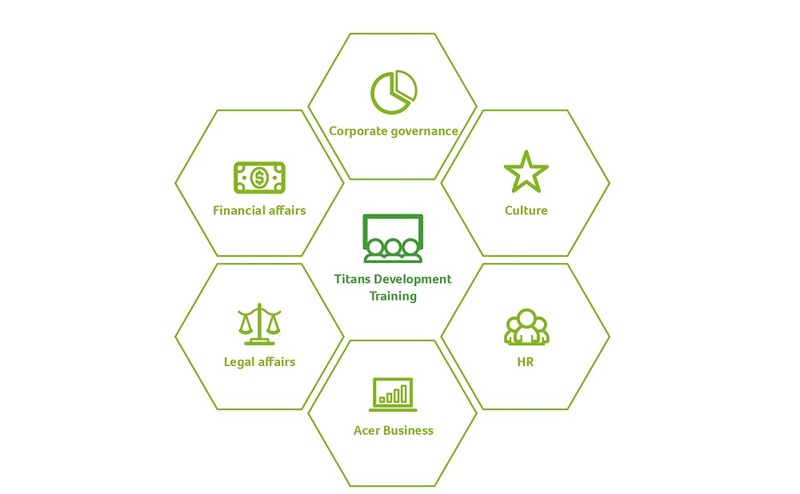 In line with the Group's “Titan Project,” in 2017 we launched Titans Development Training, aiming to cultivate outstanding talent for important leadership positions within the Group by boosting their operational judgment capabilities, accounting/financial analysis skills, operations management abilities, crisis management skills, industrial knowledge, international market perspective, leadership skills, and decision-making abilities. To ensure the quality implementation of such training, all training is done in accordance with the “Management Process of Internal and External Training,” organized on the principles of work demand, gender equality, and equality of opportunity. 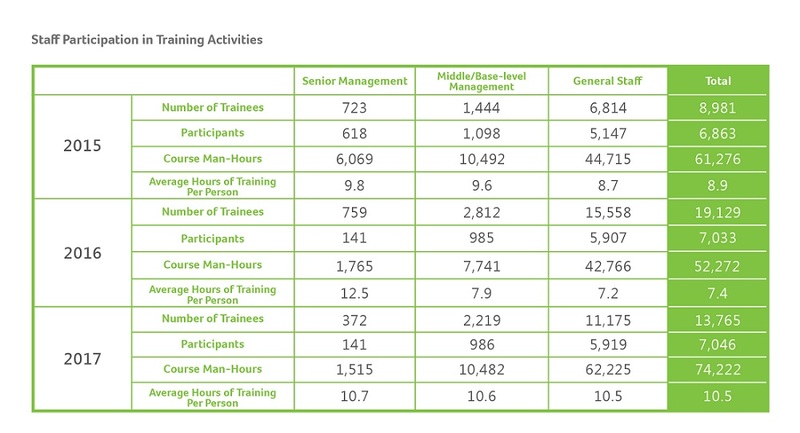 In 2017, the total number of enrollments in training worldwide was 13,766, a total of 7,046 individual participants, receiving a total of 74,222 training hours for a per-person average of 10.5 training hours, higher than in 2016. Acer supports the protection and basic principles of universal human rights. In 2017, in response to the European Union’s stricter regulations on the protection of personal information through the European Union General Data Protection Regulation (GDPR) which is set to take effect in 2018, we held GDPR training sessions around the world, with managers of nearly 200 core product lines taking part. In addition, we also conducted CSR training to help our staff understand sustainability-related performance indicators and ideas, including social issues such as labor operations, human rights issues, and freedom of association. We also held training sessions on privacy protections, with a particular focus on how our products should protect the privacy of consumers, including the use of fingerprint scanning, facial recognition, retinal scanning, cookies, IP addresses, and mobile device IDs. Note: Applies only to Taiwan and Europe regions. To cultivate an understanding of Acer's experience and management philosophy among important managers of our subsidiary companies, Acer invites company pioneers back to share their past experience. Through this, Acer can effectively pass on that operating philosophy and culture, and many potential mistakes can thus be avoided, improving operational capabilities and decision-making. In addition, we have invited well-known figures to share their experience of industry trends and innovative developments, thus broadening the management horizons of Acer staff. This is all complemented by the My Acer internal communication platform, through which we continue to promote Wangdao concepts. With regard to the improvement of professional competencies, development opportunities within the Company include job training, coaching, job transfers, seminars, and online learning. Employees can also participate in professional seminars and short-term training courses at prestigious foreign universities and training organizations. In order to encourage colleagues to obtain professional certification and improve their professional capabilities, we formulated the Incentives for Professional Certification to provide subsidies and bonuses to cover test fees for professional certification. With regard to senior management training, in 2017 the main focus was on Titan Private Training and IPO training, in coordination with the Titan Project. The aim of this was to cultivate outstanding talent among the group’s primary leadership. To improve the leadership and operations skills of their senior management, invited business coaches from the European Centre for Executive Development (CEDEP), using personalized learning models to provide guidance and assist managers in learning to cut to the core of problems in the shortest possible time, understand their own strengths and opportunities for development, respond promptly to emerging situations, and improve their overall leadership and business efficiency. In addition, senior management was dispatched to a leadership course run by London Business School and a senior management training program at Lausanne’s International Institute for Management Development (IMD). Organized a two-day Top Sales training camp to improve management and marketing capabilities in mainland China, with a total of 60 middle and senior managers taking part. In Thailand, we organized a customer satisfaction and service course attended by 54 managers to boost customer satisfaction; in Malaysia, we held Acer Day Product Training to improve staff knowledge of our product lines; and in the Philippines we brought together 28 local managers for a team motivation camp in order to boost overall team dynamics. This system provides the technical training required by the Company's various departments, as well as seminars by specialist speakers given to help keep staff up on the latest trends in product development. In 2017, we launched a series of seminars on industrial trends, inviting a team of senior research analysts from the Institute for Information Industry to give monthly talks on IoT consumer trend analysis and insights to staff from our product lines. Topics included how to use Facebook and LINE@ to build brand value, trends in the application of smart technologies to innovation in services and business, trends in key applications of and technological developments in the Internet of Vehicles, trends in AI technologies and portfolio analysis of the major players, technological developments in and future applications of fog computing, observations of trends in the development and application of 5G communications technologies, and analysis of innovative business models in emotion identification. Each department also held its own experience sharing sessions, with many focusing on implementing consumer insights in product concepts or discussing how to make business opportunities through product innovation. Our general education courses focused on how technology can be put to use to improve business performance, including practice in combining big data and business intelligence, how to quickly produce business intelligence analysis reports using Excel Power Pivot and Power Query, and how to make skilled use of cloud-based tools like Evernote, Wunderlist, and Google's Cloud Apps. We also continue to promote stronger core competencies and basic professional skills through courses covering areas like improving workplace communication and patent protection and use. On the marketing side, we held courses in visual marketing techniques using Instagram, innovative applications of mobile payments, and the use of web analytics in marketing. In addition, to strengthen concepts of personal information protection, we held special training around the EU’s General Data Protection Regulations (GDPR). On their first day of work, new staff are given orientation training to help them quickly come to grips with the Company's basic operating processes. Within their first month, new staff are put through training to better understand the Company's mechanisms, regulations, systems, corporate core values, brand spirit, corporate culture, and Standard of Business Conduct (including instruction on labor rights, freedom of expression, individual privacy rights, sexual harassment prevention, and corruption prevention), as well as strengthening their awareness of health and safety, thus helping them become fully integrated parts of the team. New staff working in product-related positions also receive training on patent protection and CSR (including green products, RBA (formerly EICC), and greenhouse gases). We also listed actively encourage staff to take training in CPR and automated external defibrillator use. The goal of Acer's performance management and development system is to improve performance at individual, departmental and organizational levels, and includes goal setting, delegation, communication & coaching, the link between performance & remuneration, and career development. In 2017, the proportion of employees worldwide involved in performance evaluations reached almost 80%.